“Marry Me in Miami” – A nationwide wedding contest in true Miami style! CORAL GABLES, FL (April 19, 2011) – Miami ties the knot! The Biltmore Hotel announces a partnership with the Greater Miami Convention & Visitors Bureau in a dream wedding contest “Marry Me in Miami” giving away a Miami wedding valued at nearly $150,000. As one of the most renownedhistoric landmark hotels, the Biltmore offers a variety of extravagant ballrooms, complete with stunning views and European architectural influences — making it Miami’s premier site for extraordinary weddings. Starting May 10, 2011, couples from across the U.S. may enter the contest and submit their love story by logging on to www.MarryMeInMiami.com. In June, five finalist couples will be randomly selected to visit Miami to compete for the grand prize in a “Wedding Day Challenge” obstacle course that will take place on June 22, 2011 on Miracle Mile in Coral Gables. The couple who wins the challenge will receive a wedding ceremony and reception for 125 guests on October 9, 2011 at the Biltmore. The Biltmore will join forces with premier wedding partners to plan and design a wedding set for true platinum status – including: celebrity wedding planner Jackie Ohh; wedding décor by Parrish Designs, Nuage Designs, Hitched Events and Uplyte; wedding cake by Elegant Temptations; entertainment by Michael Sarz, wedding photos by Rodrigo Varela; wedding video by Dream Video Production; transportation by Majestic Limousines; bridal dress by Daisy Tarsi; bridesmaids dresses by J. Del Olmo; and men’s tux by Bolado Clothiers. In addition, the Biltmore will offer hotel accommodations for the wedding party, as well as golf and spa services for the bride and groom. The wedding celebration will culminate with a farewell Champagne brunch at the Biltmore. “Marry Me in Miami” is an initiative of the Miami Romance Month program embarking in June by the Greater Miami Convention & Visitors Bureau. The program seeks to celebrate and promote Miami as the ideal city for destination weddings, commitment ceremonies, wedding shopping trips, bachelor/ette parties, proposals and honeymoons.Save the date…the Biltmore awaits! For details on the “Marry Me in Miami” contest rules and the grand prize, please visit www.MarryMeInMiami.com. To plan your next visit to Miami or for information on Biltmore weddings, please visit www.BiltmoreHotel.com. The Biltmore is Miami’s National Historic Landmark located in the exclusive Coral Gables area. The 273-room hotel resembles classic Italian, Moorish, and Spanish architectural influences spread over 150-acres of tropical landscape. A favorite of world leaders and notables since its opening in 1926, the hotel offers a restored Donald Ross 18-hole, 71 par championship golf course, tennis, the largest hotel pool in the country, private cabanas, a European spa, and an award-winning fitness center. The hotel’s dining destinations include the acclaimed Palme d’Or, which Zagat calls one of the best restaurants in the country; Fontana, an Italian restaurant surrounding the Biltmore fountain; and the poolside Cascade. In 2009, the hotel unveiled its culinary academy offering an array of hands-on cooking classes for adults and children. The Biltmore is one of South Florida’s preferred sites for business travel, high-level corporate briefings, public policy conferences, and an extraordinary wedding destination. The Biltmore is a member of the Leading Hotels of the World. For more information or to make reservations, please visit www.BiltmoreHotel.com or call (800) 727-1926. The First spread is under Centers of Attention on page 55.I highlighted the picture in blue. It is a daylight picture of my ceremony at Vizcaya Museum on the oh-so famous casino mound. The ceremony at night was a dream! Shot out to Rick Interian for making my ceremony feel like heaven! The Second spread is under Petal Pink on page 142. The small mini cakes were what the guests at my bridal shower received as their dessert. So cute! Check it out, Ive highlighted the pic in petal pink =). 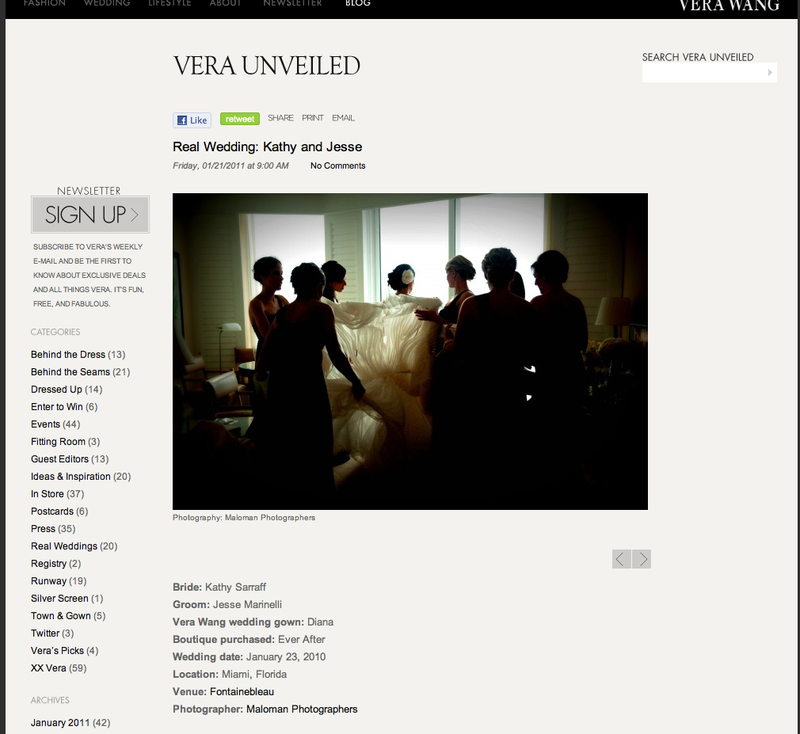 A Huge thank you to the KNOT for publsihing us. It’s a true honor to be a part of your lookbook. CONGRATS TO THE LOVELY MR. AND MRS. DOUGLAS JONES! Cristy and Danny are the most adorable couple! They are truly made for each other and it shows just by the way you catch them looking at each other. Every step of the planning was so much fun. Cristy, Mom, and I would talk for endless hours about everything you can imagine. Cristy and I share a common gastro-disorder which brought us even closer. We taught each other a lot about things to eat, not to eat, and secrets in how to control it. *Room Temp Champagne! =) * Cristy, Danny, my Hubby Carlos, and I went over for dinner recently. We laughed so much with fun memories of the wedding. As vendors we typically do not get to enjoy the wedding as much as the guests do but we had a blast just watching the couple, their families, and friends party like it was 1999. Cristy and Danny, you will ALWAYS be very special to me and I will forever remember the wedding night and every moment leading up to it. Love u! The night before the wedding, Cristy, her mom, and her bridesmaids stayed in and had a slumber party. I have been in the business for a while and have had plenty of firsts, I had another one the day of this wedding. i walked into the her bridal suite and it was the first time I had ever seen the Bride and her bridesmaids munching on cookies cupckaes, brownies, and other sweets. There was not a piece of fruit in site lol. They lived it up and did it right. How Sweet it is to be So In Love =). Thank you to Martha and Jesus Ramirez and christina Mendoza for UDS Photo for the fabulous pictures. The guys ROCK and I love love love you. For UDS’ post of Cristy and Danny’s wedding, please click HERE. Below are a couple of the amazing shots they got right after the ceremony. The ceremony took place at The Church of Epiphany in the late afternoon. It was the perfect day for a wedding. Not too cold, not too hot, just perfect. After Monsignor performed the ceremony all of the guests headed out to the cocktail hour as the couple took after ceremony pictures with their bridal party and families. Here is an overall view of the reception as it was set for dinner lighting. Any time we do color changes throughout the night, I make sure the photographers get great images of the room free of guests with the different colors we have chosen for the night. UPLYTE did an outstanding job as always lighting the room. It was perfect; exactly what we wanted. The second centerpiece was a trio of white hydrangea domes sitting on glass cylinders filled with silver branches. Silver wired branches and dendrobium orchids wrapped the cylinders to give it a unique look. The base of the table was complimented with floating candles. Glass beaded charger plates were at each place setting which brought together all of the glass that we used in the room. The pink, dark blush color is the first color we used as the guests walked into the ballroom. The final centerpiece design was a grande candelabra design with a mix of white flowers to create an over-sized arrangement. This table was for the head table where the Bride, Groom, and their parents were seated for dinner. Cristy and Danny had their own, private lovers lounge next to the dance floor. As they went through the night, they took some time here and there to lounge around. Always Flowers custom made these Mr and Mrs pillows for the lounge in white and silver to match the decor. The tables were named after places they were planning on visiting during their honeymoon to Australia and New Zealand. The guest book was actual look books of the these countries. The guests signed throughout the pages of the books on their favorite pages. They shared their first dance in a dark violet ballroom… So Romantic! Christy’s youngest brother is a true prodigy!! He ha such an amazing talent. He sang a beautiful song for his sister and new brother. It was so emotional! The couple dance the night away and enjoyed mini donuts as a mid night snack in between. Yummy! After Cristy changed into her “oh-so-fabulous” bridal sneakers, her and Danny cut their cake. It was so large, they needed to stand on chairs in order to cut it. It was so cute and the pics are absolutely gorgeous. Cristy and Danny’s Winter Wedding was published in the Spring/Summer 2010 Issue of Enchanted Brides Magazine. A picture from their decor was also featured as the front page of their design and decor section. Cristy and Danny, thank you for letting me into your lives. It was a match made in heaven on many accounts. Because of your wedding, we are now great friends and I would not have it any other way. You both are very special to me. I am so glad I was able to be a part of one of the most magical days of your lives. Thank you for trusting in me and my staff. It was truly a night to remember always and forever. Hugs and Kisses. Love u guys! As always, I’d like to take the time to Thank Everyone who was such an intricate part of putting this wedding together. I would not be able to do what do without the greatest vendors working with me. To the Ritz Carlton Coconut Grove staff, Jeysa Plana, and the captains, thank you so much for making sure our night was perfect. Martha and Jesus Ramirez, and Chrsitina Mendoza for UDS Photo. The pictures speak for themselves (WOW!) but equally as important, working with you is a dream! Ray and Jessica Roman for Ray Roman Films, you are on a level all on your own. Isabelle Melecio and Karen Cohen for Always Flowers, UPLYTE, AB Cover Designers, Carlos Oliva y Los Sobrinos del Jues, Rosie Cunil for Elegant Temptations, Donut Divas, all of the other vendors involved with this event, thank you so much for everything you do. As a team, we worked together to make this wedding a HUGe success. César Conde, President of Univision Networks and Pamela Silva-Conde, Emmy-award-winning morning news anchor at Univision.